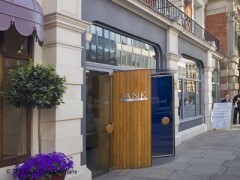 About: Bank Westminster Restaurant & Zander Bar is a smart London brasserie located in the heart of the City of Westminster. It serves a wide range of dishes from a modern British A La Carte menu in a convivial atmosphere. The exclusive list of 90 cocktails is highly regarded and the 48 metre long bar (the longest bar in Europe) is testament to this. Over the weekend they cater for families, serving brunches on Saturdays and Sundays and a special children's menu on Sunday. I have eaten here twice at lunchtime, both informal business lunches - the setting is lovely, particularly if you get a seat by the window, food excellent and service good.